With so much to explore, a Brazil honeymoon is ideal for the adventurous couple. If you’re considering a Brazil honeymoon, you and your soon-to-be spouse are in for a treat. There’s so much to see and do in this beautiful South American city, with its rich history, diverse landscape and bustling culture. Since it’s an extremely large country, the third largest in the world to be exact, you’ll want to have a game plan before you arrive. Here is your go-to guide for everything you should see and do on your Brazil honeymoon. 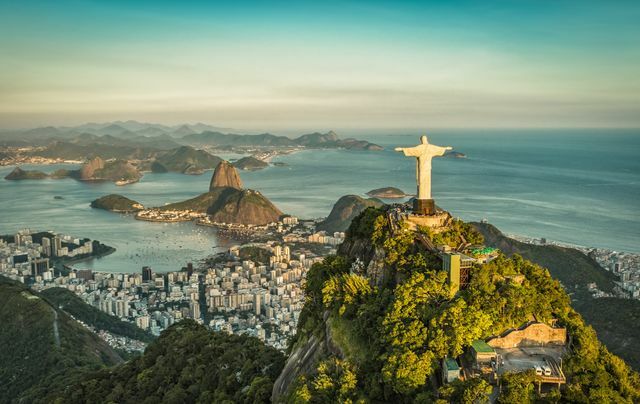 Since Brazil is the third largest country in the world and the largest, by far, in South America, its vast and diverse climate and landscape makes it an ideal destination to visit any time of year. It really depends where in the country you plan to visit to determine when the most optimal time to go might be. If you’re visiting the super popular Brazilian city of Rio de Janeiro, for example, the best time for a Brazil honeymoon is the winter months, between December and March. The weather is still warm enough to hit the beaches, you can escape the typical summer crowd and you just might be there in time to celebrate Carnival, a four to five-day festival that occurs in the month of February. If you are planning to visit during Carnival, prepare for crowds to be busier than other times during winter. If you plan to visit the northeastern coast, you’ll want to avoid rainy season, which tends to run from late May to mid-July. The driest months are typically between April and October. This vibrant, scenic and beach-centric is a top contending honeymoon destination for more reasons than we can get into. First thing first: It’s probably quite different than any other place you’ve ever traveled, unless you’ve visited it before! Plus, it’s a quick and easy-to-travel-to escape post-wedding for those looking to avoid 10+ hour flight times. There’s also little-to-no time change, depending on where you’re traveling from in the U.S. Once you arrive and get acclimated, you’re first move will probably want to be a walk to the beach. The main strip on Ipanema beach (famous for that song, “Girl from Ipanema” and so much more). Once you’ve had your fair share or sunshine and swimming, head downtown for a sightseeing tour. Cover all the important grounds including the Carioca Aqueduct, Theatro Municipal, Parque Lage and, of course, catch a glimpse of the iconic landmark, Christ the Redeemer, which overlooks the entire city. The best way to take on the Amazon during your Brazil honeymoon, yes we’re talking the Amazon, is by cruise. There are plenty that tour this untamed and remote region and offer day excursions where you can get off the boat, trek through the jungle and even spot some fascinating wildlife you’ve probably never seen before. In addition, folks who love to stay active will want to enjoy a canoe or paddle-boarding session on the infamous Amazon River. Does it get more romantic than exploring the rain forest with the love of your life? Nope! There’s a reason this southern city sounds like it belongs in Greece. It’s name comes from a Greek term that means “city.” It’s also very European, with most of its visitors coming from other large cities in Brazil as well as from European countries thanks to its large number of pristine beaches and well-respected educational institutions. On the list of beaches worth visiting, circle Lagoinha do Leste, Praia Moçambique, Ilha do Campeche, Praia Galheta and Pântano do Sul on your map. Historians will want to make a visit to Fortaleza de São José da Ponta Grossa, an 18th-century fortress that sits on a hilltop with breathtaking views, Palacio Cruz e Sousa, an 18th-century palace-turned museum and Museu Histórico de Santa Catarina, a museum all about the history of the Santa Catarina state. Nature lovers and Brazil honeymooners won’t want to miss Iguazú Falls, which was voted as one of the seven natural wonders of the world. 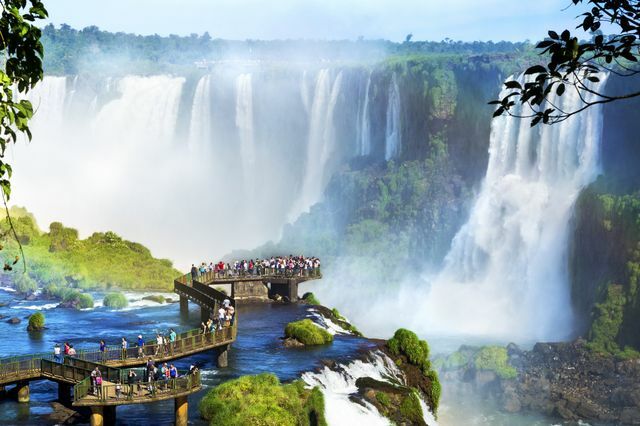 The Falls runs along the border of Argentina and the Brazilian state of Paraná, so it’s great for folks also combining their Brazil honeymoon with a visit to Argentina. On Iguazú National Park, you’ll find 275 waterfalls that measure as high as 265 feet high. Keep your eyes peeled for some fascinating wildlife, including wild monkeys, toucans, coatis, ocelots and more. While nature is what you’re after when visiting Iguazú Falls, you won’t have to camp out, unless that’s your thing. There are plenty of high-end and budget hotels in the area, many of which cater specifically to honeymooners. Honeymoon in South America or Europe?